Visit www.PAIDtoSPEAK.biz (click here), my dedicated website for speakers who want to build a speaking business! You can get much more information, download speaking templates, and much more! I still remember my first keynote presentation – June 3, 2000 – and it was my worst. For my first few years of speaking, I floundered, flopped, and nearly quit on numerous occasions. I struggled trying to “figure out” the speaking business on my own. My mistake was that I didn’t have a mentor, nor a coach … nor a system. I assumed that asking for help was a sign of weakness. All I did have was relentless passion to share a universal message that I knew would inspire others and perhaps change their life. Luckily, I broke through before I gave up. Most aspiring speakers aren’t so lucky. What I eventually learned over the years about professional speaking is a system that I continually apply today. 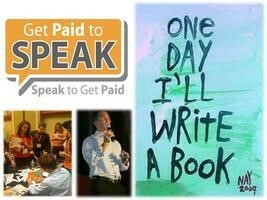 I’ve coined it PAID to SPEAK … I even wrote a book titled, How to Become a Professional Speaker: PAID to SPEAK!, which you can purchase through Amazon.com here. 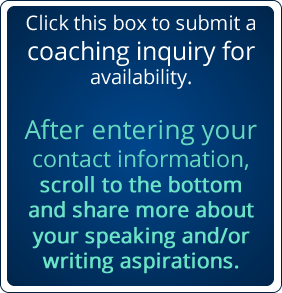 Keep reading below to find a “menu” of coaching opportunities as you seek guidance developing your system for speaking and getting PAID. To date, I’ve been honored to present in front of over 500,000 people in all 50 states and 1,150 audiences from all over the world. If you have passion to share your message like I do, then I would be interested in helping you build a speaking platform and get PAID sharing it in front of audiences. Don’t make the same mistake I did and flounder. All you need to do is learn from someone who is successfully doing it and apply your system. If you believe that your message can influence other people’s lives, then allow me help you apply my PAID to SPEAK system … because it works! You should have leads and even PAID gigs by the completion of the coaching program. I wrote my first book in 2007, titled Think Differently to Achieve Success, which I solely intended to give away for free during my speeches. Little did I know then that my book would help catapult my speaking career. To date, I’ve sold over 50,000 copies of Think Differently … and counting. Whether your dream is writing a book, speaking in front of audiences, or both, you should learn how to make that dream come to life. 2017 is your year to finally unleash your potential and take action to get the results you’re destined to receive. It would be my privilege to personally guide and coach you along that journey to become a PAID speaker, author … or both. My guided PAID to SPEAK coaching programs are offered in a variety of formats based on your preference for learning. Whether you desire personal 1-on-1, group or self-directed online or a hybrid model, I will teach and show you everything you need to know to earn PAID speaking gigs and how to write a book that can sell thousands of copies each year. How to Become a Professional Speaker: PAID To SPEAK! How would making $3,000, $5,000 or even $10,000+ per speech impact your life? What if you could generate an extra $10K – $20K in book sales this year? Don’t do what I did and learn the hard way – rather, do what I do now! By enrolling in one of my coaching programs, you’ll learn all my expertise that took over a decade to develop and successfully apply. You will receive sample speech proposals, contracts, templates, marketing strategies, promotional resources … and much more! You will also receive access to me personally as well as my bureaus and associations. I will review your material, provide personalized feedback and get you started on how to earn PAID speaking bookings and a published book in hand! If you are willing to work hard and hold yourself accountable, I ensure that you will earn PAID speaking opportunities much faster than I did and have a lifetime of knowledge. Please note: I am neither a life coach nor an accountability coach. I am a coach for speakers who are absolutely serious about building a speaking business and making money. I will show and guide you along the way but, respectfully, I cannot make you a successful speaker if you will not work as diligently as I will alongside you during the coaching program. If you share my mindset of “No excuses – only results,” then let’s have a conversation about your speaking. 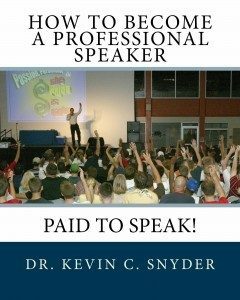 Guidance through my book, How to Become a Successful Speaker: PAID to SPEAK! Book writing resources, templates to sell thousands of books, publishing resources, proposals, How to Write a Book in 90 Days eBook, etc. … and much more! See below!